Musical Recommendations: I want to recommend some young instrumentalists who are not afraid of technology or conventions. Norwegian trumpeter Hilde Holsen last year on ASK. She has a very clear mind and a directness in her music that will reach far / Heida Karine Johannesdottir Mobeck and Anja Lauvdal, two emerging musicians using tuba, keyboards and electronics in the noise duo Skrap, in the pop-band Broen and creating radical and highly listenable inventions for larger groups such as Skadedyr and a concert to come with Trondheim Jazz Orchestra. I composed from I when was very little. I played the violin at a young age, but we also had a piano, and it was on this instrument that I started composing. Perhaps it was because no one guided me that made me appreciate it so much. I am not from an artist family, there are amateur violin players on my father’s side, but I never had any pressure from home to do music. I regret that a little of course, as it took me almost twenty years to realise that I would try to make music the mainstay of my life. There is a diary from when I was around eight with a long list of composition titles but unfortunately no scores. And there are no recordings. Imagine that from the online-sharing perspective of today: growing up with no one recording you! I have some vague memories of two pieces: Steinras (Avalanche) and a much more sentimental composition, Døde Roser (Dead Roses). One can perhaps say that I still oscillate between such polarised aesthetics in my work today. I have always felt drawn to the sadness in melodic music, and on the other hand, violent and energetic chaos. For my confirmation I got a Roland D20, and I left mainstream classical music for good. In my late teens, I composed music for school musicals and got into jazz, focusing on singing in musicals or bands. Music being my greatest hobby, I decided to spend a year with music full time at a folk high school after gymnasium, but intending to continue with an academic career in science, was the plan after that. But that year changed everything for me. I started to listen to contemporary music and a whole new world opened up. I felt a strong urge to be a part of that, and when I learned about living composers and the possibility to study composition at the Norwegian Music Academy, I was deliberate in my choice to study there. It took a couple of attempts to make the entry exam, and it was with jazz vocals as a compulsory main instrument that I entered the composition department, a highly unusual combination. My exceptionally diverse background is something I benefit from both in my work as a performer and composer, and not in the least as a listener. I find defined music genres limiting and often uninteresting, and rather focus on the interplay of elements in any kind of music, and how it speaks to me. My score writing is of course founded upon the classical tradition of writing for orchestras, chamber music and choirs, but the approach, how I sometimes use those tools may allow me to invent new ways of combining different traditions and methods. On this path there have been several influences such as Zorn, Xenakis and Varèse. And in the beginning of my grown-up endeavours to compose, the music of Scelsi, Messiaen and Nordheim was especially important. As I child, I remember composing as something very positive; surplus energy released in a self-satisfied mood. Picking up composition as a young grown-up, I recall the initial difficulties with tackling harmonies, caged by the compromise of the tempered scale. As I result I started with composing percussion music, and gradually moved onto timbre-based pieces building on sound analysis and overtone spectrums, using the computer as a tool, both in the composition process and in pieces deploying electronic sounds. I got into musique concrète thinking and I started to listen to sounds as envelopes with pitches and volume, not associated to the source. As a student I met the standard challenges of writing smaller intervals than the tempered scale, and I made a lot of effort to make playable music without making too many compromises. This is something I still work on in my written music. Sometimes I aim too high, making the process unnecessarily difficult and time-consuming for both me in the process of writing and for the performers to play. But my music consists of many, much more traditionally written scores, such as several songs written together with accordionist Frode Haltli. While still studying, it was mainly the music and methods of Olivier Messiaen that gave me courage to also write pieces with harmonies and melodies drawing on classical modalities and jazz. Besides composing, the performances I have done over the last twenty years using vocals, often with live electronics, and most often in an improvised setting, has also greatly influenced my composing, my methods and thinking about form, timbre, and the aspect of communication. I have also felt, while composing, the challenge of grasping some of the immediacy that a performance gives. Over the last years I have combined performance and improvisations more and more with more traditional composing, perhaps starting with the Concerto for Voice which features me as an improvising soloist with an orchestra. I have a studio where everything on the floor is on wheels: desks, lockers and drawers – some with speakers on them, so that I can move things around according to what I am working with. I can work in surround and place myself in the middle of the room, or I can sit by the window and write on a score. The walls, besides two windows facing the woods where I live, are covered with pictures, cables, posters, some for isolation purposes. My accordion-playing husband uses the room for rehearsals when I am away. In an essay I wrote about inspiration in 2006, I mentioned Bruce Mau’s Incomplete Manifesto for Growth where he says that one shouldn’t tidy one’s desk, one never knows what can come in useful. Today I more often have the opposite problem, I tend to collect too much, and in order to be creative I have now separated the regular office doings to another place, so that doesn’t happen in the studio. Since I already mentioned the voice concerto, I can start with that. The piece exists in several versions, the first commissioned by Radio France for the Festival Présences in 2004. The challenge was to make a piece for orchestra featuring myself as a soloist. I quickly decided that my part had to be very free, making use of my long training as improviser. I also decided not to bring in live electronics for this concert, just some amplification of small sounds that could bring up interesting and perhaps unheard constellations of sounds, small or large, acoustic or amplified in the concert space. My voice is hence amplified the whole time, together with a second soloist playing an old-fashioned typewriter. Another limitation is to strictly use the voice as an instrument, with no text or narrative other than the various sounds, pitched or un-pitched coming from my mouth. The orchestra part is composed to respond to my highly individual vocal sounds and sometimes I also let go in improvised vocal sections building on the orchestral score. In Concerto for Voice I deal with so-called spectral harmonies, in this case as a part of a series of works with the subordinate title moods deploying the analysed spectrum of the lowest tone of a tenor saxophone played as in jazz. The score is largely based upon an transcription (a slightly impossible task!) of an earlier electronic piece, Sinus Seduction (moods two), using the same tenor saxophone manipulated with distortion, filtering out its 29 strongest overtones and linking three multi-phonics with common overtones as basic building material. A version for sinfonietta will be released on the record label 2L this year. 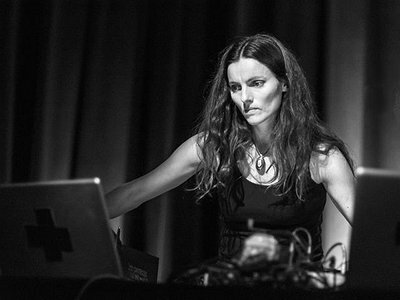 Electronic music and computers are essential in my work, both as performer and composer. I use tools on all levels, but I don’t work with algorithmic composition, I dislike giving the compositional choices, even on the level of details, to the computer. I use analysis, filters and synthesis a lot in my work, in scores as well in performances with live-electronics. As many composers somehow related to the ‘spectral school’, I don’t feel obliged to stay true to the idea that form is alone derived from timbre. Composition is most of all a musical construction, where objects relate to each other in a life-giving context. Some reviewers, lately some Norwegian classical male reviewers, are so occupied with the fact that I am also an improvising performer that they choose to understand my composed music as mainly impulse-based material, being too concerned with the timbral aspect of my music. I guess I can only blame myself, bearing in mind my many words focus on the sound itself, but nevertheless, form is to me the most important aspect of composition, and the sole reason I consider myself mainly a composer. Form must be carefully planned to avoid the obvious, and each piece has its own logic. In a dance performance, sound and bodily movement can together create duration, but music is also full of movement in itself, when the sound unfolds in space, as real as any visual action. I am still intrigued by this way of thinking. I would say that music has its own duration, which differs from other time-based arts, much due to the simultaneity of and interchange between layers, not to be found on such level in any other art form. When performing improvised music, in the moment while “everything” is at stake, I get a strong feeling of being outside conventional clock-time and it’s predictable forms. More than focusing on details, I get occupied with forming a logical (can be contradictory!) whole based on what I feel is at stake in the music in the now, with the past and the future possibilities present. Connections appear between musical elements within the frames that constitute the musical form to come. This state is hard to achieve, but it can be trained, one important prerequisite is avoiding too much outer motivation. For Bergson, ‘intuition’ describes a level of consciousness that exceeds all forms of conceptual knowledge. The “intuition” is the act of coupling the subconscious to reality. You recognise the result of your intuitive work, but often after you made it, often a surprising musical being. When working “outside time” with time-based art such as composing a score, you rely on combining practical skills with the knowledge of how music creates time. I often say that you have to feel the form while working on a piece, then you will know intuitively when you are on the right track, even when surpassing conventional logic. Perhaps it’s intuition that becomes one’s aesthetic filter, what you seek in art, or your “artistic signature”. Form is too me the most important aspect of composition, and the sole reason I consider myself mainly a composer. Form must be carefully planned to avoid the obvious, and each piece has its own logic.